Jennifer Welling, Project Manager - California Consulting, INC.
Jennifer Welling is a Project Manager with California Consulting. 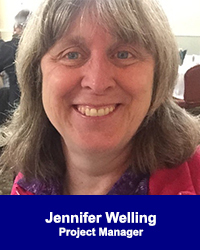 Based in the Santa Cruz area of the Central California coast, Jennifer Welling has 30 years’ experience as a grant writer and grants manager. In addition to a successful consulting business for more than 20 years, Welling spent 12 years as Grants Officer/Subaward Specialist for the Office of Sponsored Projects at the University of California, Santa Cruz. Working primarily with the Ocean Sciences, Institute of Marine Sciences, and Ecology & Evolutionary Biology Departments, this work involved the submission of federally and privately sponsored proposals for faculty research. Concurrently, Welling served as the Subaward Specialist for the university, managing all extramural agreements and amendments, and maintaining all federal A-133 (now Uniform Guidance) compliance and monitoring requirements. Welling has had success writing private foundation and corporate foundation proposals for programs for children with developmental and physical disabilities, performing arts programs, multicultural arts events, educational and arts enrichment programs, parent support and assistive technology programs for autism, and autism early intervention for young children. Welling finds the greatest reward in grassroots grant management and grants writing. California Consulting client, Azusa Unified School District, was awarded the California ASCD Outstanding Instructional Leader 2017 Merit Award! Congratulations to Superintendent Linda Kaminski for receiving this wonderful award.